This shrine is situated in tehsil and district Kasur. One has to get off the train at Rao Khan Wala or Raja Jang railway station. Its distance from both the railway stations is about 12 kms. This shrine is in village Kalu Khara and hence it has been named as Kalu Khara Ram Thaman. 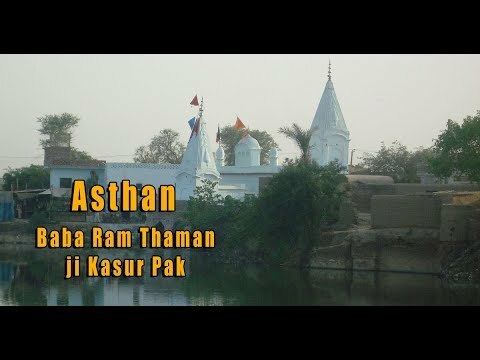 Baba Ram Thaman Ji was the son of Guru Nanak Dev Ji’s maternal aunt. He was a prapti Sadhu. During his life time Guru Nanak Dev Ji visited this place on several occassions. The Gurdwara has been built beautifully in the style of a fort. There is a large tank which has now become a pool of dirty water. A beautiful temple is built at the main gate of this tank. A fair used to be held every year from 14th of Chaiter to Visakhi. This fair is still held but lacks the luster of the past. Thousands of i acres of land and an estate has been granted to this shrine. A shrine called “Gave di Mal” is in front of this Gurdwara where beautiful buildings have been built. Justice Baba Bay Nath Ji was a renowned resident of this village: Mela (Fair) of Baba Ram Thamman was organised jointly by the people of the area irrespective of their religion or creed. Now the Muslims organise this fair and the Hindus, Jains, Christians and Buddhists from Lahore enthusiastically participate.